Jenny Lewis looked around Room D of the storied Village Recording Studios taking it all in, as she and Jason Bentley reminisced on its rock & roll lore. “Tusk” by Fleetwood Mac was recorded right in that same room, as was “Angie” by the Rolling Stones… and on and on. 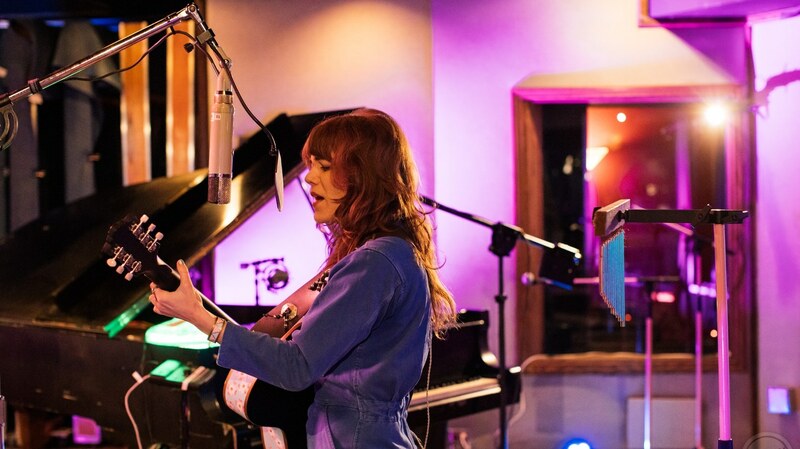 For Jenny Lewis to record a live session behind her fourth solo album “On the Line” here made great sense. Her status in LA music history has certainly solidified, as she’s crafted an adored catalogue of music (both solo and work with her former band Rilo Kiley), while carrying the banner of Laurel Canyon artists before her. Joni Mitchell, Neil Young, CSN and others would be proud. Further cementing her place within the hierarchy of the LA music scene, the players on her new album probably only answer the phone for a select few who call. Ringo Starr, Benmont Tench (founding member of the Heartbreakers), Beck, Don Was, and THE session drummer of all drummers Jim Keltner all contributed their talents for the recording of “On the Line”. The new album definitely has a pedigree that shines, and that magic transcended to her performance in the legendary studio. On the Line was recorded over a couple years, with the beginning stages going down at another LA music landmark: Capitol Studios. Beck helped out, and producer-of-the-moment Shawn Everett (Alabama Shakes, The War on Drugs, Kacey Musgraves) also put his golden touch to it. The result is a big, warm rock album. Lewis’ signature wit and thoughtful songwriting about love and excess is sharp throughout, and perfectly exemplified in the catchy, confident chill of “Wasted Youth.” A song that carefully balances pop against a backdrop of heavy themes. Though her illustrious pals didn’t join her at the Village, her band elevated every track, sounding wire tight and ready for the road. Speaking of, they’ll be touring for the next few months, including a sold out stop at the Hollywood Palladium, May 11th. She told Jason that the Palladium is the last original LA room she has yet to play (her excitement is beyond), continuing in a pattern of performing at LA staples, like the Fonda and Echo. Just another well deserved accomplishment for one of our local indie-rock heroes. Jenny Lewis‘ voice is as alluring as her lyrics. At times punchy and defiant, but always warm and honest. On her new album “On The Line”, she delivers piano-driven songs with hints of country under tones. 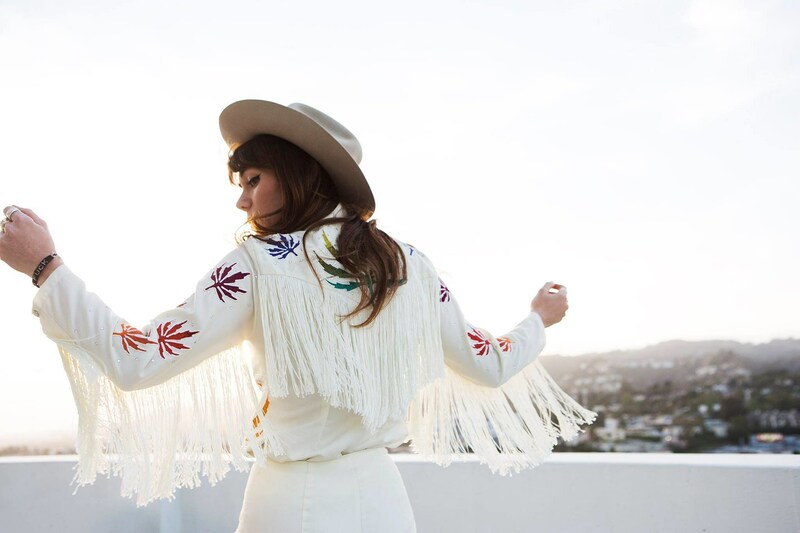 Jenny Lewis has released an infectious new single titled “Wasted Youth” from her forthcoming album “On The Line”, due out Friday, March 22nd. Jenny Lewis releases her fourth solo album, On The Line – the follow up to 2014’s critically acclaimed The Voyager on Warner Bros. Records. The 11 all new original songs were written by Lewis and recorded at Capitol Records’ Studio B, and feature a backing band of legendary talent including Beck, Benmont Tench, Don Was, Jim Keltner, Ringo Starr and Ryan Adams. The track, which sounds like vintage memorabilia in new packaging, was previously debuted during Lewis’ live-streamed hangout session/listening party for On The Line. ‘Wasted Youth,’ ‘Heads Gonna Roll’ and ‘Red Bull & Hennessy’ comes from Jenny Lewis’ new album ‘On The Line’ – available March 22nd! Indie idol and former Rilo Kiley frontwoman Jenny Lewis has released her third solo album, titled On the Line. It’s a masterful and sprawling record, sometimes devastating and other times soaring to great emotional heights. Lewis manages to convey a complete portrait of herself as an artist who has been through the gauntlet of rock stardom and made it to the other side vibrantly, loudly alive. Jenny Lewis is in a sharing kind of mood this February, dropping new song “Heads Gonna Roll” . Late last year, Jenny Lewis teased that her new album, would be one of our most anticipated of 2019, was on its way early this year. After unleashing a pair of suspicious tweets, Lewis confirmed the new record is called On The Line, and it’s not dropping until March 22nd on Warner Bros. Records. The news arrives with the album’s first single, “Red Bull & Hennessy,” which arrived with a twinkly accompanying visualizer. “Red Bull & Hennessy” is Lewis’ first new music since her 2014 album The Voyager, and on this love song-turned-party song, she makes an invigorated return in a fit of bluesy electric guitar, “high on Red Bull and Hennessy.” She teases and taunts (“Don’t you wanna kiss me? Don’t you wanna even try?”), only to proclaim she’s “higher than you.” After five silent years, the singer/songwriter and former Rilo Kiley frontwoman is back and burning brighter than ever. The unstoppable Jenny Lewis has shared another new track from her forthcoming album On The Line titled “Heads Gonna Roll.” The follow-up to the sultry “Red Bull & Hennessy” features Ringo Starr on drums, Benmont Tench on the organ and Don Was on bass. And with arms fully outstretched today, Lewis has also announced a string of additional 2019 dates to her already-extensive tour. Back in July, The Leo Weekly published an interview with Jenny Lewis where she is quoted as saying “I’m actually finishing up a mix on my record this week.” So, unless The Leo Weekly is lying, this news comes straight from one of America’s most beautifully voiced mouths. Alert your appropriate Kleenex stockists: tears incoming. From the new album, The Voyager, available everywhere now. Earlier this year, Jenny Lewis reissued her 2005 solo debut, Rabbit Fur Coat, to mark its 10th anniversary. In celebration of the 10-track remastered vinyl release, Lewis performed seven shows in four cities with the Watson Twins and M. Ward as support. Lewis is now adding more dates to the anniversary tour, with stops in Boston, Washington D.C. and San Francisco later this year. The album, which was released while Lewis was a member of Rilo Kiley, features collaborations with Conor Oberst, Ben Gibbard, M. Ward and the Watson Twins. In addition to the Rabbit Fur Coat tour, Lewis has joined forces with Au Revoir Simone’s Erika Forster and the Like’s Tennessee Thomas to form the trio Nice as F— (NAF). Lewis debuted the new supergroup at a Bernie Sanders benefit concert in New York earlier this month. The band is set to open for M. Ward on select dates of his tour this spring. A solo artist is just what Jenny Lewis became with the rootsy “Rabbit Fur Coat,” which originally came out in January 2006 and — with closely observed tunes about love, religion and her complicated childhood — opened a new chapter for one of pop music’s smartest, funniest songwriters. 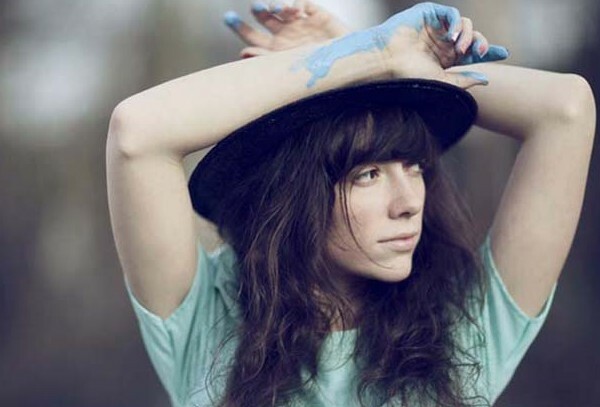 Since then, Lewis (who began her show-business career as a child actor in 1980s movies like “Troop Beverly Hills”) has released a string of acclaimed albums, including 2014’s “The Voyager.” She’s also recorded with Elvis Costello and Brandon Flowers and toured as a member of the Postal Service. Now she’s celebrating the 10th anniversary of “Rabbit Fur Coat” with a tour on which she’s playing the album in its entirety with help from M. Ward and the Watson Twins, who appeared on the original album. Jenny Lewis commented on the look back at this tour, I don’t tend to look back in my life, which is probably why I’ve found myself in some pretty weird situations. But I think touring with the Postal Service a couple of years ago changed my perspective on that; it showed me how important it is to reflect, to kind of assess the songs from your life. The moment I started singing with the twins, I knew it was meant to be. It really reminded me of when I started singing as a child with my mother and my sister in the San Fernando Valley. That’s when I discovered music. And working with women has led to some of the most satisfying moments of my musical life. Some of the most difficult, too, because my relationship with my mother is a difficult one. But it’s almost karmic that I reach out to women in my work. Next year marks the 10th anniversary of the album “Rabbit Fur Coat”, the debut solo album from Singer Songwriter Jenny Lewis featuring The Watson Twins. To commemorate, the singer-songwriter will reissue the Album , also on special edition red vinyl on January 29th. Additionally, Jenny Lewis will embark on a short US tour in early 2016, where she’ll be accompanied by the Watson Twins and M Ward. Both acts joined her for her original “Rabbit Fur Coat” tour back in 2006; M. Ward also contributed to the album, appearing on Lewis’ cover of the Traveling Wilburys track “Handle with Care”. 03. Rise Up with Fists!! When Bjork recently spoke about the tendency to credit men with the genius of a woman’s art, she could have been looking straight at critics about to write about the fantastic debut album from Natalie Prass. Over nine songs, Prass shows a range in songwriting, from anthems to confident R&B burners to whimsical prairie folk to theatrical grandeur. It is the debut of a songwriter not struggling to find a voice, but fully formed and confident as all hell. She makes knowing nods to Joni Mitchell, Lesley Gore, Diana Ross and Joanna Newsom, all while seeming natural and instinctual. She is the product of her influences and still original.